You Are Here: Home » Got Milk? · Nutrient content of goat milk is slightly less than cow milk but goat milk is more digestible because the fat molecules are one-fifth the size of those from cow milk — making it easily tolerated by those with compromised digestive systems. · Seventy-two percent of the milk used throughout the world is from goats. It is one-third richer than cows milk but more nourishing and easier to digest. · The flavor of goat milk is comparable to that of cow milk. Goat milk has a milder taste. · Goat milk has no cream separation because of smaller fat molecules. · Goat milk contains pre-formed Vitamin A in the milk fat that allows it to be readily available for use by the body. · Goat milk is closer to human milk and is therefore easily accepted especially by those young or frail. · Goat milk does not form mucous (phlegm) and is therefore better tolerated by asthmatics and those with allergies. · Goat milk contains more chlorine, fluorine and silicon than any other domestic livestock. Chlorine and fluorine are natural germicides and fluorine assists in preventing diabetes. · Goat milk contains 2% curd, which precipitates in the stomach. Cows milk is 10% curd. · Goats are naturally immune to diseases, such as tuberculosis, and are used in third-world countries to actually cure tuberculosis because of their inherent antibodies. · Goats milk is tolerated by a compromised /damaged liver because of the smaller fat molecules and it’s naturally homogenized. · Goats milk has the ability to “sweeten” the intestinal tract and assist with constipation. · Goats milk contains a higher evolved carotene (pro-Vitamin A). Researchers have found this to have cancer preventing properties. 9 Responses to Got Milk? Remember me, Trish? This is Sandy from Michigan. just got a new zealnnd kiko billy goat , will be crossing my saanen nannys with him next fall for good milk and meat goats . do you think this is a good or bad idea ? However, if you want to maintain pure breeds, then you shouldn’t mix them. 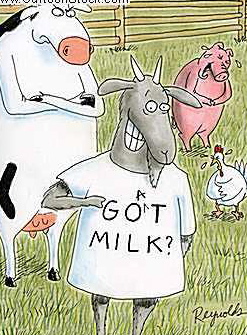 Do you sell goat’s milk? Our four month old granddaughter has reflux and has twice been hospitalized because of it. My daughter has tried powdered goat’s milk but her pediatrician has given my daughter a recipe which requires actual goat’s milk. We live in Riceville but go through Spring City when we go to Nashville to see our grandchildren. It is so much more scenic than I40! We will be going in the next couple of days. Please let me know whether you sell it, how much it is if you do sell it and, if not, where I might be able to buy some. Loved your website. Hi, Trish. This is Sandy. I’ve been looking for you so long.